Therefore, we decided to check – how much this program is invisible to the user. 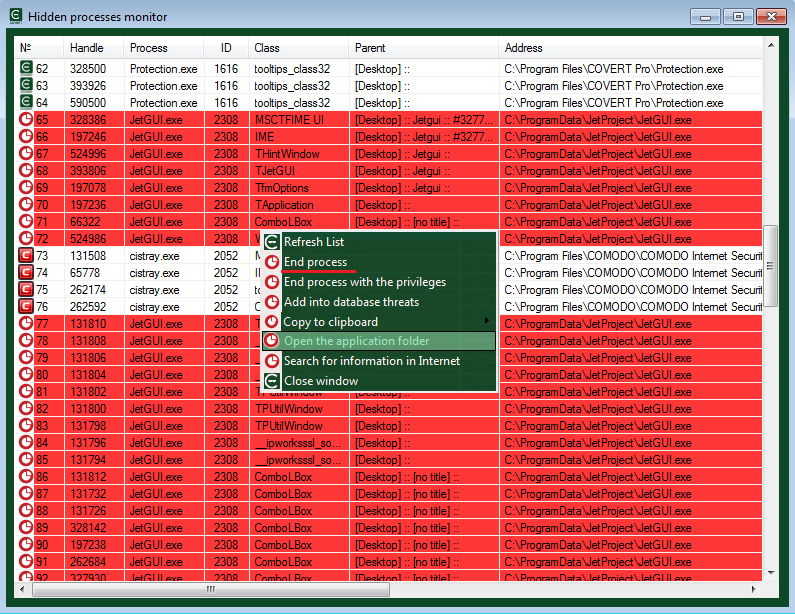 Let us start COVERT Pro and open the “Processes” monitor. In the menu, we select “Hidden processes“. 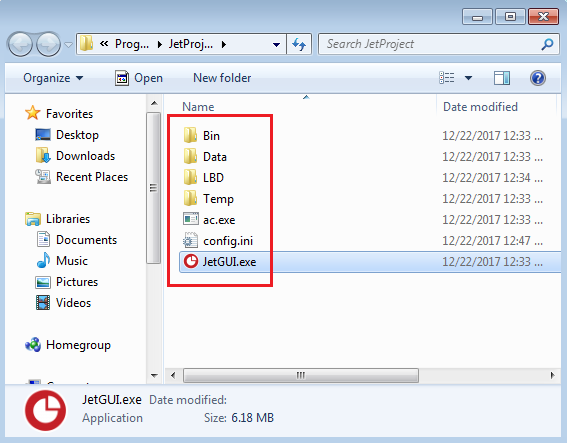 The process JetGUI.exe (highlighted in red) belongs to the application JETLOGGER. It was not so difficult to find this spyware. To get rid of JETLOGGER surveillance, you should find its location on the computer – right click on the line with the spyware and select “Open the application folder” from the menu (see the screenshot of the hidden processes monitor). 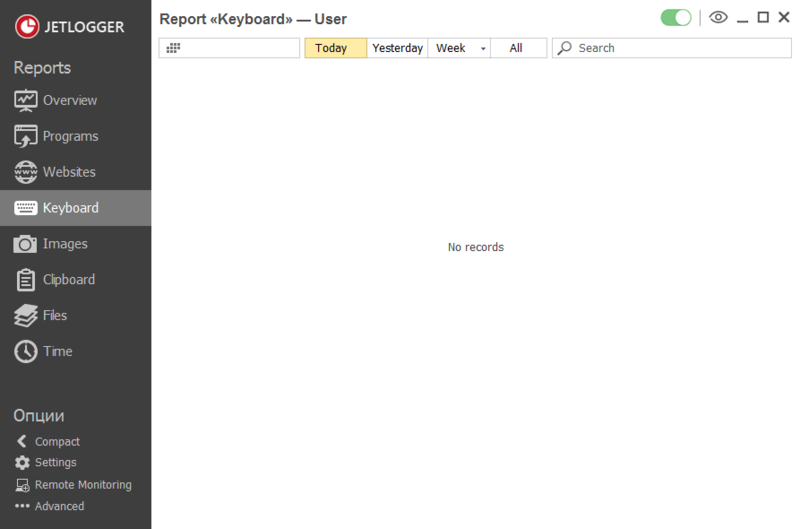 Then, in the same menu, select the “End the process” and delete the folder along with its contents. Similarly, in the context menu of the “DLL Monitor” select “Disconnect“, confirm your actions and reboot the computer. After restart, the JETLOGGER spyware program will be uninstalled. You can hide all your actions without removing JETLOGGER. Enter to the COVERT Pro secure platform, and all actions performed inside (entering text, visiting websites, watching videos, etc.) will not be recorded by the spyware. You can get to the secure platform by clicking on the largest button of the main menu with the logo and the inscription “Login to the secure platform.” Screenshot below shows empty logs of the spyware. In the end, we present the results of our traditional test on virscan.org. Only 7 out of 39 antivirus consider JetGUI.exe as a threat for the user. It’s not so bad. We often see that only one or two antiviruses can detect such kind of spyware. We rate this spyware program as RLM: 8 / 3 / 2.